"I was moved by the way in which you spoke to the hearts of the young Israelis .Our youngsters, in times of need, are always willing to stand up and defend their country. Today, you have seen how much the same young people long for peace," President Shimon Peres said Thursday evening during a ceremonial dinner in Jerusalem held in honor of visiting American President Barack Obama, who addressed some 600 Israeli students in Jerusalem earlier in the day. Among the 120 guests at the President's Residence in the capital were the president of the Supreme Court, the governor of the Bank of Israel, the IDF chief of staff and the directors of the Mossad and the Shin Bet. Nobel Prize Laureate Ada Yonath and author David Grossman were also on hand, as was newly-crowned Miss Israel Titi Aynaw. "I am very excited to meet the leaders of the country and presidents Peres and Obama," she said. "I will say thank you to Obama and tell him he was a great inspiration in my life; and not only in my life. He broke barriers. He fought; he studied; he worked hard for everything he has achieved." Peres said in his speech, "This morning several rockets were shot from the Gaza Strip towards civilian targets, including Sderot, which you have visited (...) Today the enemies of peace spoke in the only language they know, the language of terror. I am convinced that together we will defeat terror. In the course of the ceremonial dinner Peres presented Obama with Israel's highest civic award – the Presidential Medal of Distinction. "It is my privilege to present you with our country’s highest honor, the Medal of Distinction. This award speaks to your tireless work to make Israel strong. And peace possible. Your presidency has given the close ties between Israel and the United States a new height. A sense of intimacy. A vision for the future. The people of Israel are particularly moved by your unforgettable contribution to their security. To defending our skies. To the collaboration in the domain of intelligence, which is the right way to preempt bloodshed. The diplomatic and military bonds between us have reached an unprecedented level. "When I visited you in Washington, I thought in my heart: America is so great and we are so small. But I learned that you don't measure us by size, but by values. When it comes to values, we are you and you are us. "On occasion, when we were alone, you stood with us. So we were not alone. We were alone together. We shall never forget it. During your previous visit to Israel, you asked me if I had any advice to offer. It is not in my nature to let questions go unanswered. So I suggested that while people say that the future belongs to the young, it is the present that really belongs to the young," Peres said. Addressing Obama's speech in Jerusalem, Peres said "You noted in your address today that peace is the greatest hope. I share your vision. Your call to reopen the peace process may pave the way for the implementation of the Two State Solution agreed by all of us. As you said: A Jewish state - Israel. An Arab state - Palestine. Next to you sits the reelected Prime Minister Binyamin Netanyahu. He opened his address to the Knesset by reiterating his commitment to the two-state solution." Turning his attention to the Iranian nuclear program, Peres said, "I am convinced that you will do whatever is necessary to free the world's horizons and the skies of Jerusalem from the Iranian threat. Iran denies the Shoah and calls for a new one. Iran is building a nuclear bomb and denies it. "The Iranian regime is the greatest danger to world peace. History has shown, time and again, that peace, prosperity and a stable civil society cannot flourish where threats and belligerence abound," Peres said. After receiving the Medal of Distinction, Obama said he "could not be more deeply moved" by the award, but stressed that he was accepting the honor not for himself but for the American people. "This is an extraordinary honor for me, and I could not be more deeply moved. But I have to say, after the incredible welcome I have received over the past two days and the warmth of the Israeli people, the tribute from President Peres, the honor of this medal – I mean, as you say, dayenu (it would have been enough)," he said. "Now I'm told that the Talmud teaches that you shouldn't pronounce all the praises of a person in their presence, and Mr. President, if I praised all the chapters of your remarkable life, then we would be here all night. So let me simply say this about our gracious host: Mr. President, the State of Israel has been the cause of your life through bitter wars and fragile peace, through hardship and prosperity. You've built her; you've cared for her; you've strengthened her; you've nurtured the next generation who will inherit her. "You mentioned that this medal is presented in recognition of progress towards the ideals of equality and opportunity and justice, but I am mindful that I stand here tonight because of so many others, including the example and the sacrifices of the Jewish people. In a few days, as we do at every Seder, we'll break and hide a piece of matzo. It's a great way to entertain the kids. Malia and Sasha, even though they're getting older, they still enjoy it, and there are a lot of good places to hide it in the White House. "But on a much deeper level, it speaks to the scope of our human experience, how parts of our lives can be broken while other parts can be elusive, how we can never give up searching for the things that make us whole. Few know this better than the Jewish people. After slavery and decades in the wilderness and with Moses gone, the future of the Israelites was in doubt. But with Joshua as their guide, they pushed on to victory," said the American leader. 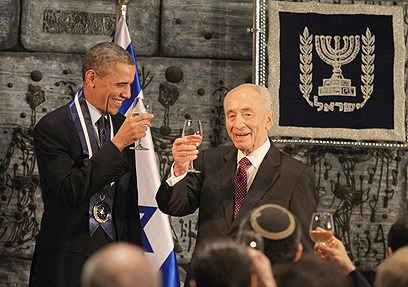 In a toast to Peres, Obama wished him "ad mea ve'esrim" the traditional Jewish blessing that someone should live to be 120, which was the age of Moses when he died. 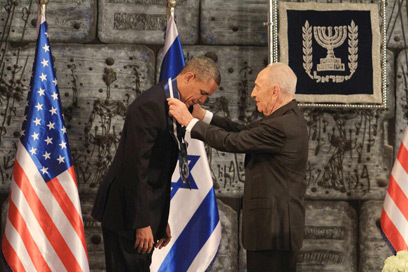 See all talkbacks "President Peres bestows Medal of Distinction on Obama "